This is an account of an episode I would have never wished to report. It shows how skeptics are not immune to hoaxing and it emphasizes the importance of preventing future events like this in skeptical organizations. On November 15, 2001, Argentine UFOlogist Francisco Fazio was a guest on the TV show Movete. He presented a World Trade Center video, where a UFO could be seen “filmed” flying near the Twin Towers (supposedly on July 24, 2000)1. The video originally aired on the Sci Fi Channel more than a year earlier, as a promotional clip2. This (video) was debunked pixel by pixel. This was admitted by a company called Edefex. This was the first time that Sanz mentioned the company Edefex. The next time was when he published an article titled “El ovni que no fue” (“The UFO that wasn’t there”) on the ASALUP Web site, (www.asalup.org) on November 17, 2001, one day after the television debate with Fazio. The article drew the attention of journalist Alejandro Agostinelli, who wondered about the source quoted by Sanz. There was no sign of a company called Edefex on the Web. The only thing he could find was a short mention dated 1995, on a Brazilian Web page, as The Edefex Group USA. The journalist, who at that moment was producing a TV special, sent an e-mail to the Sci Fi Channel and he got an automatic reply. A producer in Los Angeles phoned Sci Fi and nobody answered his questions about who the maker of the WTC video was. From then on, Agostinelli inquired after Sanz several times. Sanz answered that he had taken the Edefex information from a Mexican UFO Web site, this being confirmed via “fax by a technical who had worked for Sci Fi.” Sanz said he was sending the “papers.” But nothing came. Agostinelli, who knew the reliability and seriousness of the magazines that had published the article, advised Sanz to write a note clarifying the question. Note that he said he had exchanged some correspondence with a Mexican man named Hugo Gimenez Moreno. On another e-mail that Sanz sent to the internal mailing list of ASALUP, Sanz says “the whole thing was handled through conventional mail.” What happened was not clear, mainly because Sanz seemed to have a different answer for each person. Ten months later, by the end of September 2002, there was no note, no disclaimer, and no reply. Agostinelli had asked and waited for the information over ten months. Not only did he not receive an answer, but he made an astonishing discovery: On the Mexican Web site X-Files Mexico (not online anymore) there was an article by Arturo Lugo and Cesar Buenrostro with entire paragraphs identical to those in Sanz’s article5. The point was that this Mexican article was written and published before Sanz’s article. And one more thing: Sanz didn’t mention any source and didn’t quote any author. The article published by ASALUP was signed by Sanz as if it was from its own writing. However, it looked like a copy. And that copy quoted a dubious company. A little later, Lic. Carlos Dom’nguez pointed out to Agostinelli and I another copy made by Sanz. This was an earlier article about the Fox sisters, “La Casa de los Espiritus” (“The House of the Spirits”) that was published by January-February 2001 in the CAIRP’s twelfth newsletter6, signed by Sanz. The original article belonged to Claudio Trivisonno and its title was “Charlando con Elvis. Una explicacion cientifica del espiritismo” (“Chatting with Elvis. A Scientific Explanation of Spiritualism”). Sanz added only a paragraph at the beginning and end, and put the whole article under his own name. Agostinelli and I decided that we had arrived to a point where we had to make our findings public. Over ten months had passed without reply or clarification. So, on October 9, 2002, I sent a message to the mailing list “Incredulos” which belongs to ASALUP and whose administrator is Sebastion Bassi, saying that I’d seen these irregularities and asking for a clarification of the whole thing. They said that there was no evidence regarding the copy that Sanz had made of the Mexican article, and that the Edefex quote could be a mistake. It is very strange to maintain a “mistake” online for ten months, particularly when the author, president of the association, had been notified of it and said that he was going to correct it. From then on, he began to talk of a “document,” “paper,” but not of a “fax” until October 7, 2002, ten months later. If he had already said to Agostinelli that “that info was confirmed through a fax” . . . why did he, at the same time, allude to a “correspondence” with a Mexican man? Why didn’t he continue to talk of a fax all the time? Sanz also mentioned a “technical” who has worked for the Sci Fi Channel. But in the first e-mail mentioned here, he gave the name of Hugo Gimenez Moreno. And ten months later, he mentioned Arturo Lugo. Until now, ASALUP members kept on saying that Lugo was the man who sent that fax. But Lugo is missing. Sanz was alternating two different names all the time, and the imprecise description technical. This was not clear at all. On October 8, 2002, one of the members of the Directive Board of ASALUP, Max Seifert, resigned. He is the only one who went away right after he discovered that Sanz’s behavior was highly suspicious. Seifert asked for proof and evidence (Where is the fax? Why had Sanz signed a copied article as if he had written it? Where is the evidence that Edefex exists? ), while the rest of ASALUP members inverted the burden of the proof: they asked Seifert to prove that Sanz was wrong. Sanz was the (supposed) author of the article, the one who quoted a (non-existent) company, and the recipient of the fax. On October 10, 2002, a member of the list “Incredulos,” Carlos Alvarez, sent a private e-mail to the vice-president of ASALUP, Norberto Maraschi in which he said that the correct name of the company was Edefx (without the “e”). This was the first time that the real name of a company was mentioned, eleven months after the release of the article on the ASALUP Web site. 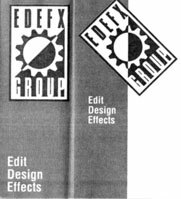 Actually, there was a company named Edefx Group, but we couldn’t be sure if this was a “mistake” or not. Four days later, on October 14, 2002, Carlos Alvarez sent another e-mail, this time to the mailing list “Incredulos” saying that the correct name of the company was Edefx and that it was acquired by the Miami Broadcasting Group (in fact, the correct name is Miami Broadcast Center). And this fact caused Sanz and the rest of ASALUP members to begin talking about Edefx instead of Edefex. So it was easy for Sanz to search for this name on the Internet and get all the company data. 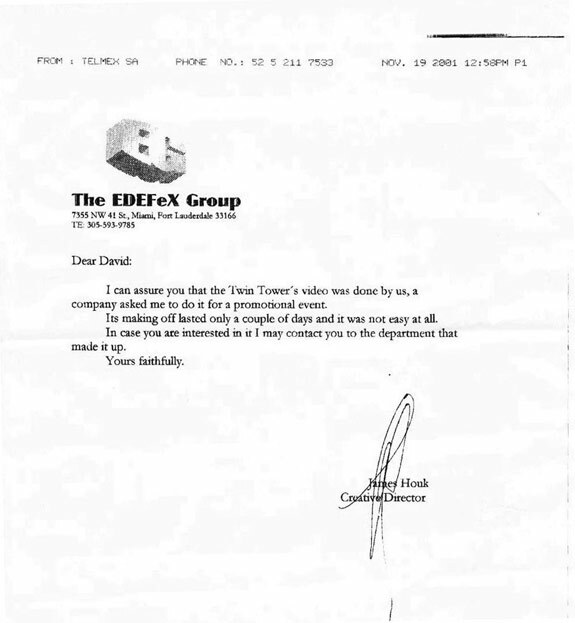 The question is: how could he receive a fax with an Edefex logo in November 2001, when he knew about the true company data on October 2002? There seems to be two options: Either he received a falsified fax or he invented one. The note itself has no date (except for the fax). Just below the logotype, there’s an address: 7355 NW 41 St., Miami, Fort Lauderdale, 33166. TE. 305-593-9785. Is it in Miami or Fort Lauderdale? There are no two cities with the same postal code. The usual abbreviation for “telephone” in the USA is “Tel.,” “Phone” or “Ph.” Have you ever seen “TE.”? In fact, TE. is the Argentine abbreviation (it belonged to Telefonos del Estado, the old state telephone company in Argentina). This feature points to an Argentine author. The scanned image is a square. It is a strange shape for a sheet of paper. It should be A4, letter, or legal. Most office notes have a line below, showing its data: address, telephone, e-mail, etc. It is not shown here. Why? The fax, supposedly coming from Mexico, was received by Sanz just one or two hours before its supposed presentation on a TV show. There is no way to contact the man who supposedly sent that fax to Sanz (claimed to be either Hugo Gimenez Moreno or Arturo Lugo). Anyway, nobody could contact Arturo Lugo, who supposedly gave Sanz his authorization to reproduce fragments of his article. According to the number typed by the fax machine receiving the fax, it was sent from the telephone number 52 (country code of Mexico) 5 2117533. This number belongs to a company called Televinet, and has nothing to do with any Arturo Lugo. At Televinet they didn’t know anything about Cesar Buenrostro (co-writer of the copied article) or Hugo Gimenez Moreno either. There is something here I need to clarify. On point number 5) I say that Sanz received that fax just before his supposed presentation on a TV show, because until that moment he had said that he had received the fax the same day he went to the TV debate with Fazio, though in another e-mail (see above) he said that he received the fax and the day after he showed it on TV. As can be seen, the fax is dated November 19, 2001, so one could expect that the TV debate was held on the same day, as Sanz and Maraschi said. That’s not true. I was really surprised when I got a copy of the TV debate with Fazio. It was not on November 19 but on November 16, three days before the date Sanz and Maraschi claimed to have received the fax! And, of course, he didn’t show anything simply because the fax couldn’t exist at that date. When the members of ASALUP were aware of all the “mistakes” contained in that fax, they had no choice: Sanz was asked to resign the presidency of ASALUP. But all these “mistakes” were discovered by Seifert, Agostinelli, and myself in a couple of hours. In spite of the fact that they had that “evidence” twenty-eight days in front of their eyes, they didn’t find anything! Remember that Sanz showed the fax to the members of ASALUP on October 15, and they published it on their Web site on November 12. Step by step, we were doing the job that should have been done by the members of ASALUP. They were supposed to investigate this case, though the man who was suspected was their own president. ASALUP again put the questioned article online, removing the name of Edefex and quoting an “authorization” they obtained from Cesar Buenrostro after this episode. The supposed first and valid authorization by Arturo Lugo was never shown and neither Sanz nor any member of ASALUP presented any proof of its existence. In the name of fighting against pseudoscience, the president of ASALUP (now former president) and its members used, and even supported, methods typically used by pseudoscientific individuals. I think this is the worst “favor” that a skeptic organization could do to skepticism. More than that, when critical inquiries were made, instead of analyzing the evidence they hid it. Far from expelling a member that had copied articles and quoted false sources, they tried to cover it up until it was unavoidable. Three of the people who accused Sanz and ASALUP were censored and “moderated” in the mailing list “Incredulos,” and two of them, Agostinelli and Seifert, were fired by the list administrator Sebastion Bassi. Some Consulting Members of ASALUP resigned after being notified of this episode. The goals of ASALUP were literally copied from those of CAIRP. The only difference is that they were not carried out. This chaotic situation led to the resignation of vice-president Maraschi, German Buela, and Orlando Liguori. Thanks to Alejandro Agostinelli and Max Seifert. I want to express my gratitude to Luis Gomez, Pedro L. Gomez Barrondo, Julio Arrieta, G. Brasas, Carlos Dom’nguez, Mart’n Fragoso, Arturo Mar’n, Jamee Houk, Marcos Obad’a and Enrique Marquez for their support. Thanks to GP Producciones for providing the videotapes of the TV shows. The video of the supposed UFO is still online at http://www.scifi.com. Sci Fi encourages the discussion in a forum without making a statement on the authenticity of the video. Many visitors refer to the film as a “promotional commercial.” Nobody mentions it as a “documentary.” See, for example: bboard.scifi.com. ASALUP is the acronym for Asociacion Argentina de Lucha contra la Pseudociencia (Argentine Association for the Fight Against Pseudoscience). Sanz ignored that evidence of the copy remained in the Google engine search cache. CAIRP is the acronym for Centro Argentino para la Investigacion y Refutacion de la Pseudociencia (Argentine Center for the Investigation and Refutation of Pseudoscience). It was the first skeptic organization in Argentina, which operated until August 2001. Agostinelli denounced Sanz’s copy on an article called “Engaeados por un… Àesceptico?” (Deceived by a . . . skeptic?) on the Chilean Web site La Nave de los Locos (www.geocities.com/lanavedeloslocos) and in El Esceptico Digital-Edition 2002 No. 08 December, 2002, accessible through www.elistas.net. One resumed version can be found at http://superiores.blogalia.com. It was first published as a “comment” on the ASALUP Web site, but it was eliminated from the site after presenting the false fax.